Plasma Etch systems have been used in many areas of research and production at many world class companies and universities around the globe. 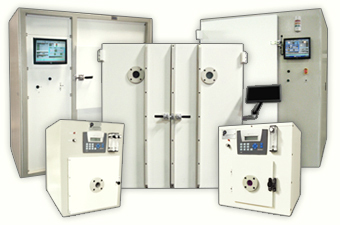 We build customized systems for nearly all plasma applications. With over 35 years of experience in building plasma systems and collaborating with other companies, we have developed some of the most effective, cost-efficient plasma treatment systems in the industry. Our world class systems mix fast processing speeds with consistent, repeatable results. We have a rich history with plasma solutions deployed in all areas of cleaning, etching, and surface modification. Abstract: Reconstituting tissues from their cellular building blocks facilitates the modeling of morphogenesis, homeostasis and disease in vitro. Here we describe DNA-programmed assembly of cells (DPAC), a method to reconstitute the multicellular organization of organoid-like tissues having programmed size, shape, composition and spatial heterogeneity. DPAC uses dissociated cells that are chemically functionalized with degradable oligonucleotide ‘Velcro’, allowing rapid, specific and reversible cell adhesion to other surfaces coated with complementary DNA sequences. DNA-patterned substrates function as removable and adhesive templates, and layerby-layer DNA-programmed assembly builds arrays of tissues into the third dimension above the template. DNase releases completed arrays of organoid-like microtissues from the template concomitant with full embedding in a variety of extracellular matrix (ECM) gels. DPAC positions subpopulations of cells with single-cell spatial resolution and generates cultures several centimeters long. We used DPAC to explore the impact of ECM composition, heterotypic cell-cell interactions and patterns of signaling heterogeneity on collective cell behaviors. View the full article. Abstract: Polyimides are widely used as chip passivation layers and organic substrates in microelectronic packaging. Plasma treatment has been used to enhance the interfacial properties of polyimides, but its molecularmechanism is not clear. In this research, the effects of polyimide surface plasma treatment on the molecular structures at corresponding polyimide/air and buried polyimide/epoxy interfaces were investigated in situ using sum frequency generation (SFG) vibrational spectroscopy. SFG results show that the polyimide backbone molecular structure was different at polyimide/air and polyimide/epoxy interfaces before and after plasma treatment. The different molecular structures at each interface indicate that structural reordering of the polyimide backbone occurred as a result of plasma treatment and contact with the epoxy adhesive. Furthermore, quantitative orientation analysis indicated that plasma treatment of polyimide surfaces altered the twist angle of the polyimide backbone at corresponding buried polyimide/epoxy interfaces. These SFG results indicate that plasma treatment of polymer surfaces can alter the molecular structure at corresponding polymer/air and buried polymer interfaces. View the full article. Abstract: We demonstrate that the electrical property of a single layer molybdenum disulfide (MoS2) can be significantly tuned from semiconducting to insulating regime via controlled exposure to oxygen plasma. The mobility, on-current and resistance of single layer MoS2 devices were varied up to four orders of magnitude by controlling the plasma exposure time. Raman spectroscopy, X-ray photoelectron spectroscopy and density functional theory studies suggest that the significant variation of electronic properties is caused by the creation of insulating MoO3-rich disordered domains in the MoS2 sheet upon oxygen plasma exposure, leading to an exponential variation of resistance and mobility as a function of plasma exposure time. The resistance variation calculated using an effective medium model is in excellent agreement with the measurements. The simple approach described here can be used for the fabrication of tunable two dimensional nanodevices on MoS2 and other transition metal dichalcogenides. View the full article. Application of epifluorescence scanning for monitoring the efficacy of protein removal by RF gas–plasma decontamination. Helen C Baxter, Valeri I Kovalev, Greg DeLarge, et al. New Journal of Physics. 11.11 (2009). Abstract: The development of methods for measuring the efficiency of gas–plasma decontamination has lagged far behind application. An approach to measuring the efficiency of protein removal from solid surfaces using fluorescein-labelled bovine serum albumin and epifluorescence scanning (EFSCAN) is described. A method for fluorescently labeling proteins, which are adsorbed and denatured on metal surfaces, has been developed. 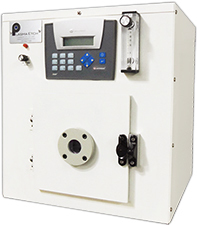 Both approaches have been used to evaluate the efficiency of radio frequency (RF) gas–plasma decontamination protocols. Examples with `real' surgical instruments demonstrate that an argon–oxygen RF gas–plasma treatment can routinely reduce the protein load by about three orders of magnitude beyond that achieved by current decontamination methods. View the full article. Directed assembly of asymmetric ternary block copolymer-homopolymer blends using symmetric block copolymer into checkerboard trimming chemical pattern. Huiman Kang, Gordon S. W. Craig, Paul F. Nealey. Journal of Vacuum Science & Technology. 26.6 (2008). Abstract: Here, the authors studied the directed assembly of the asymmetric ternary blends, composed of polystyrene-block-poly(methyl methacrylate) copolymer(PS-b-PMMA) and the corresponding PS and PMMA homopolymers, on a checkerboard chemical pattern which was fabricated by e-beamlithography, controlling the periodicity (LS), length (D), and spacing of the exposed lines or dashed lines in the chemical pattern. The checkerboard chemical pattern, which cannot be generated with typical self-assembled block copolymer morphologies, consists of either offset, parallel, dashed lines, or alternating lines and dashed lines, and is used in the fabrication of dynamic random access memory. The degree of perfection and domain uniformity of the assembled block copolymerthin films on the complex pattern were a function of the commensurability of the volume fraction of PS in the blend (ϕS) with the fraction of area on the pattern wet by PS(FS) as well as the volume fraction of homopolymer in the blend (ϕH). The best assembly occurred ϕS and FS were commensurate, and ϕH was optimized for the given blend and pattern. View the full article. Morphological Reconstruction and Ordering in Films of Sphere-Forming Block Copolymers on Striped Chemically Patterned Surfaces. Baxter, Helen C , Valeri I Kovalev, Greg DeLarge, et al. Abstract: The morphology of thin films of sphere-forming block copolymers on striped chemically patterned surfaces was investigated as a function of thickness and commensurability of the pattern period (Ls) and the lattice spacing of the spherical structure (Lo), using scanning electron microscopy and atomic force microscopy. In all cases, a linear wetting layer forms on the chemical pattern. As the film thickness increases from 10 to 25 nm, protuberances in the wetting layer appear. In 57 nm thick films, when Ls and Lo are sufficiently commensurate, the protuberances in the knurled, linear wetting domain and the spheres in the overlying layer of P(S-b-MMA) coordinate during equilibration, resulting in an ordered hexagonal array of partial spherical domains. The range of commensurability over which such an ordered hexagonal structure is achieved decreases when the film thickness is increased to 70 nm. In general, the process leads to a pattern transformation from a series of parallel lines at the substrate surface to an ordered, hexagonal array of spots at the free surface of the film as the block copolymer starts to reconstruct its bulk morphology away from the chemically patterned surface. View the full article. Modeling the Etching Rate and Uniformity of Plasma-Aided Manufacturing Using Statistical Experimental Design. K. C. Yunga, J. Wanga, S. Q. Huanga, et al. Taylor & Francis Online. 21.8 (2006). Abstract: The response characteristics of an O2/CF4-based plasma process used to desmear and etch back multi-layer rigid-flex printed circuit board were examined using a two-level fractional factorial experimental design. The effects of variation in RF power, temperature, gas proportion and gas flow (CF4 and O2) on several output variables, including etch rate, process uniformity and selectivity were investigated. The screening factorial experiment was designed to isolate the most significant input parameters. In the experiments conducted, increases in the etching rate generally corresponded to decreases in uniformity. Etch uniformity was strongly dependent on temperature and gas proportion. The relative significance of polymer deposition and ion bombardment was separated. Using this information as a platform from which to proceed, the subsequent phase of the experiment developed empirical models of etch behavior using response surface 3-D plots. The models were subsequently used to optimize the etching process. View the full article. Cross-Linked Random Copolymer Mats As Ultrathin Nonpreferential Layers for Block Copolymer Self-Assembly. Abstract: We report the effect of increasing amounts of glycidyl methacrylate (GMA) in random copolymers of P(S-r-MMA-r-GMA) on the formation of nonpreferential mats for the assembly of P(S-b-MMA) block copolymers. Increasing the GMA concentration in the random copolymer from 1 (PG1) to 4 (PG4) mole % increased the cross-linking efficiency and reduced the effective minimum thickness of the cross-linked mat for perpendicular alignment of P(S-b-MMA) from 6 nm to 2 nm. The compositional window (so-called perpendicular window) of PG4 was defined for both symmetric and asymmetric P(S-b-MMA). Compared to PG1, incorporation of higher amount of polar comonomer (GMA) in PG4 shifted the perpendicular window toward higher styrene fraction as a result of the increased polarity. The defined perpendicular window for P(S-r-MMA-r-GMA) is equally applicable for random copolymers prepared by both controlled living and classical free-radical polymerizations. View the full article. Clear castable polyurethane elastomer for fabrication of microfluidic devices. Karel Domansky, Daniel C. Leslie, James McKinney, et al. Lab on a Chip. (2013). Abstract: Polydimethylsiloxane (PDMS) has numerous desirable properties for fabricating microfluidic devices, including optical transparency, flexibility, biocompatibility, and fabrication by casting; however, partitioning of small hydrophobic molecules into the bulk of PDMS hinders industrial acceptance of PDMS microfluidic devices for chemical processing and drug development applications. Here we describe an attractive alternative material that is similar to PDMS in terms of optical transparency, flexibility and castability, but that is also resistant to absorption of small hydrophobic molecules. View the full article. SERS-active silver nanoparticles on electrospun nanofibers facilitated via oxygen plasma etching. Ying Bao, Chuilin Lai, Zhengtao Zhu, et al. Abstract: Manipulating the interaction between inorganic building blocks and polymeric supporting materials is crucial in the fabrication and optimization of hybrid hierarchical nanostructures. Herein, oxygen plasma etching was used to modify electrospun nanofibers of poly(methyl methacrylate) (PMMA) for facilitating the growth of silver nanoparticles (Ag NPs). The PMMA nanofibers in the form of overlaid films, surface-decorated with Ag NPs, were explored as active substrates for surface-enhanced Raman scattering (SERS). Strong SERS enhancement was observed from the Ag NP–PMMA films as well as individual nanofibers. Our work not only fabricated nanocomposite materials with controlled hierarchical structures and remarkable SERS performances, but also provided a versatile method in tuning interfacial interactions within nanostructured materials. View the full article. 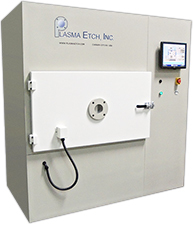 For real world plasma applications from university research to production level throughput, Plasma Etch is your best bet for plasma treatment options. Contact us today at sales@plasmaetch.com for a free quote along with helpful advice in selecting the best system for your needs. 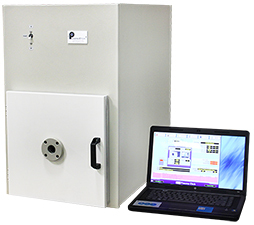 The PE-25 is an affordable yet fully automated entry level option for plasma surface modification. The BT-1 is our most popular industrial solution for industrial surface modification.